Reply to WordPress Comments with Quick Mail – Where Did My Brain Go? Quick Mail is a WordPress plugin. 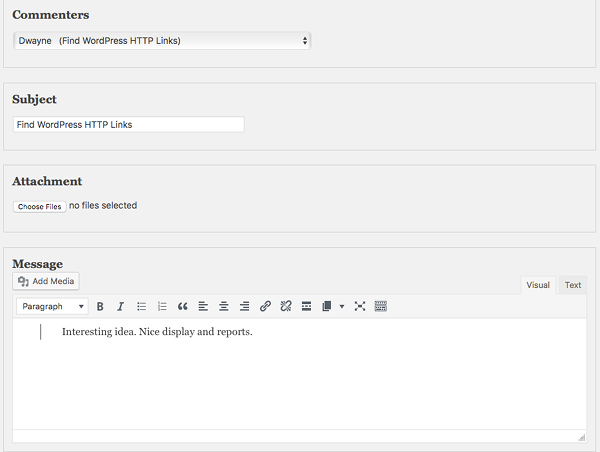 Use Quick Mail to send an email with shortcodes and attachments from the WordPress dashboard. Quick Mail includes options to send email to members of your site, or anyone. Quick Mail was created to send email to WordPress users on a site, without looking up their email addresses. Quick Mail was published two years ago. I use Quick Mail regularly, and try to improve it. The latest development version of Quick Mail adds features to reply to comments on posts and pages. WordPress does not include an option to reply to comments privately. I created two. My first idea was to add “Reply with Quick Mail” to comment notification emails. I added a link to Quick Mail that recognized the comment ID, and used the comment_notification_text filter to add it to the notification email. Selecting the link opens Quick Mail with the commenter’s and comment. Unfortunately, it is not reliable. WordPress notifies authors of new comments and approved comments. My link was only added to new comments. I left this feature in the new Quick Mail development version, but I found a better way. Quick Mail was designed to select recipients from a user list. 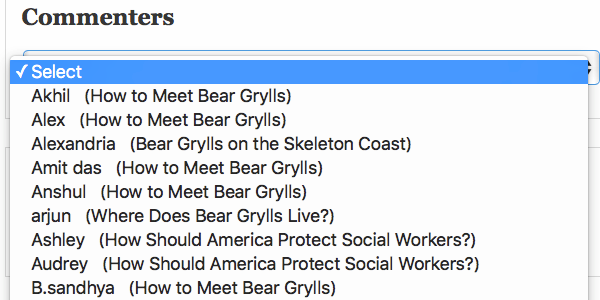 I created an alternate user list with commenters. Users who are unable to access the User List, see a simplified message. It is a huge improvement! Authors must be able to reply to comments, but they do not have access to the User List. Editors can reply to comments, even if they cannot access User List. Administrators decide how to limit permissions. Blogs have hundreds or thousands of comments. Too many comments to display. I considered only listing new comments. I wanted to add a time limit, like a week. But, everyone’s site is different. I did not want to limit choices. Discussion Settings includes an option to close comments on posts / pages after 14 days. I hope people use it. It seems unlikely that authors want comments on old posts, that might have been replaced with newer information. Therefore, I only display comments from posts / pages with “open comments.” If you disabled comments or closed comments on a post, old commenters will not be displayed. After you select a comment, the email form is automatically filled. The page / post title is the subject. The comment is quoted to begin a message, and the cursor is located at the end of the comment, to make it easier to reply. WordPress includes the Akismet plugin, to identify spam messages. Unfortunately, Akismet does not identify invalid email addresses. Quick Mail checks each email domain with checkdnsrr() before displaying it. Download Quick Mail 3.1.0 Beta from Github. Please use Github Issues to report problems. If you do not have a Github account, I also check messages on Quick Mail support. Quick Mail 3.1.0 Beta was tested with WordPress 4.9 nightly releases, including multisite. Review my previous articles on Quick Mail for additional information.